I’ve been trying to cut down on sugar and when I saw Jessica’s raw brownie bites, I felt inspired. They looked so rich, so indulgent, and so chocolatey. But is that how they’d taste? I was determined to find out. I rummaged around in my oatmeal topping drawer (That’s how much I love oatmeal. I have an entire drawer dedicated to stuff I can top my bowls with! ), pulled out the ingredients and whacked them in my food processor. My food processor isn’t powerful at all wasn’t doing much to the fruit and nuts, apart from sending them on the wildest rides of their lives. Overcome with disappointment, I put on my happy face (one of my New Year’s resolutions is to be more positive!) and pulled out my NutriBullet. And I’m so glad I did! Over 5 minutes, my food processor had done nothing but slightly bash and bruise the ingredients. 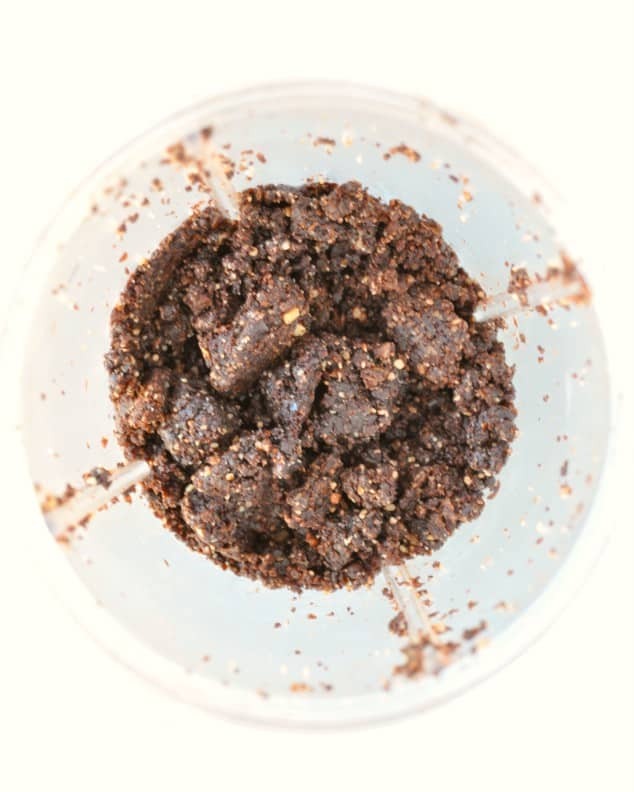 But in just 10 seconds, my NutriBullet had totally ground everything down into the fabulously chocolatey paste you can see below. I hate to admit it, but sometimes fancy kitchen equipment is worth the price tag. Even as I was rolling the mix into individual no bake energy balls, I was still a little sceptical. It’s not like I don’t love healthy snacks. It’s just that I’ve been let down by so many recipes like this I wasn’t expecting much. But as soon as I popped one into my mouth I was stunned. These delicious bite-sized pieces of heaven turned out to be one of the most amazing snacks I’ve ever had the pleasure of nibbling on! One thing I do need to warn you about with these chocolate brownie no bake energy balls is the noise when you’re making them! 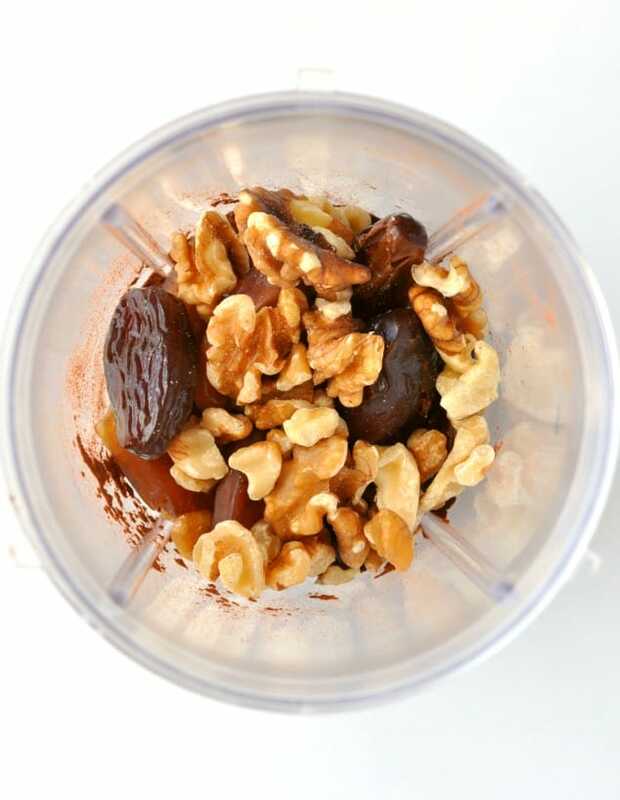 Throw hard nuts into a NutriBullet and you’ve got to expect some noise. But seriously? I had no idea just how much noise they would make! They're seriously chocolatey (without the use of any actual chocolate! ), oh-so fudge-like, incredibly rich and genuinely satisfying. And because they're so luscious, you can get away with only eating one or two of them and feeling 100% happy, indulged and satisfied without overdoing it. Place all the ingredients into a NutriBullet and blend until you've got a thick dough. Scoop out 1 tablespoon-sized pieces and roll each one into a ball. If the mixture is too dry and crumbly to form balls, wet your hands with water and try rolling the balls again. 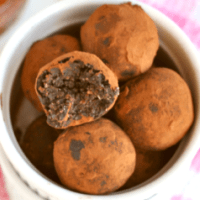 Roll each of the balls into a small bowl filled with cocoa powder and store inside an air-tight container in the fridge. Store the vegan brownie bites inside a sealed container in the fridge until you're ready to eat. I like energy balls but don’t have them too often – these look incredible though so I could see myself eating them a lot more regularly lol! Thanks, Bintu! They’re so much better than a LOT of other energy balls I’ve tried! 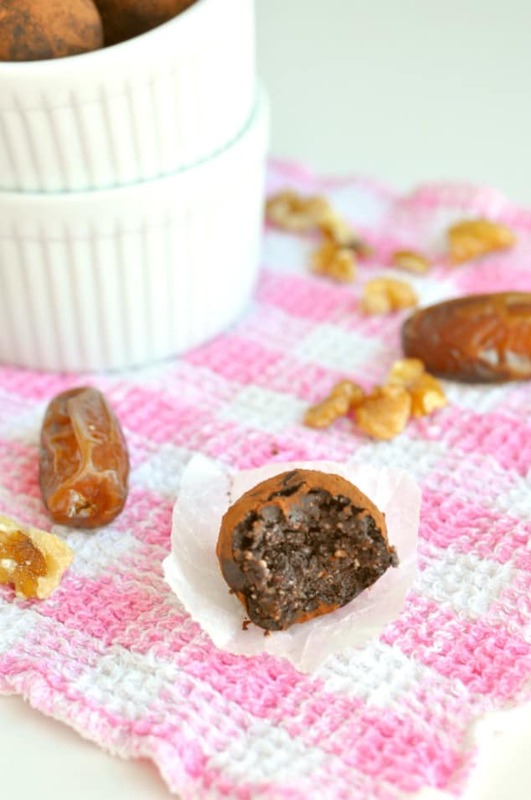 Absolutely perfect snack balls and so easy to make! Thank you for sharing the recipe, will be making them tonight! These look absolutely delicious – I can’t wait to try them. And now I know that I NEED an oatmeal topping drawer. Haha! Oatmeal topping drawers help make breakfast time a lot more fun and interesting! Oh yum! These look so tasty! Perfect for curbing my chocolate cravings and enjoying pre-gym! They definitely will satisfy your sweet tooth! They’re so chocolatey that you’d never believe they don’t contain any actual chocolate! YUM! These brownie bites look absolutely delicious! Thanks so much, Vera! And rolling them in coconut flakes sounds like an amazing idea. I’m definitely going to try that one out for myself! I totally have an oatmeal topping cupboard! Glad I’m not alone haha! I just made these and added some cocoa nibs (because I accidentally have 2 pounds of them- long story). Absolutely to-die-for amazing. I’m honestly shocked because other bites I’ve made end up staying in the fridge until I toss them out but these are beyond delicious! Thank you for sharing! All the best people have oatmeal topping cupboards 😀 I’m so glad you enjoyed my recipe! 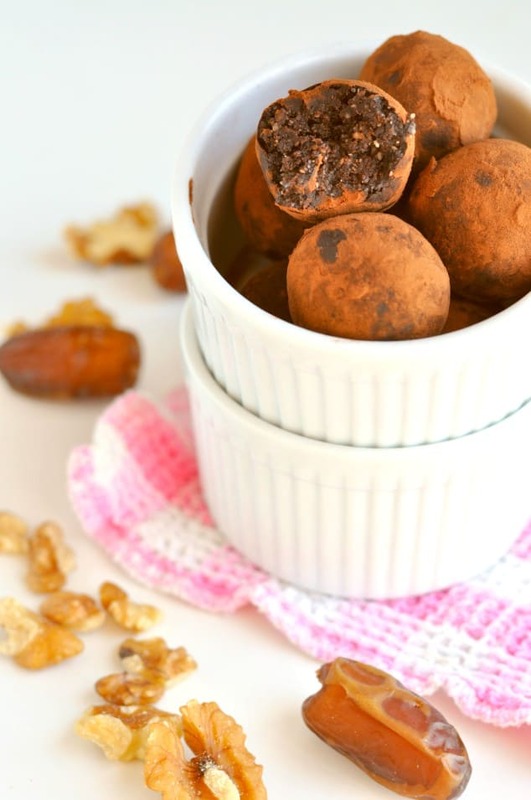 I feel the exact same way – I hate most energy balls, but I looooove these ones! I have raw cocao powder. Would they come out too bitter using 3 tbsp?